Few films have been chewed up and spit out and rinsed down the drain as gleefully as Brian De Palma's Mission to Mars. I think people doing so have missed something crucial though. They spend so much time taunting De Palma for being a copycat that they forget that his referencing previous films often include referencing his own. I see Mission to Mars as a companion piece to Carrie, a retelling of that film’s pivotal scene. In Carrie, Carrie and Tommy are at the prom and are having a great time dancing in ecstatic spirals -- amplified by De Palma's swirling camera. As frightening as the idea is for Carrie, she is in love. Asked how she is feeling, she replies, "I feel like I'm on Mars." Shortly after that, Carrie has those feelings doused in pig’s blood. She is crushed at the moment of her life’s greatest pleasure. But why is she hurt really? She knows none of the kids in her school like her. She knows she doesn't belong at the prom much less being so honored at one. She is so hurt because she has taken the big risk and allowed herself to fall in love, a state where one is at her most vulnerable. And when one falls in love with another, the two biggest fears, the two things that would be the most devastating are being hurt by that person and losing that person. At that climactic moment, Carrie is hit – over the head – with both of these fears. Was Tommy a part of all this? Is he dead? Move forward to Mission to Mars. Carrie’s throwaway line about being in love feeling like being on Mars has been re-employed by De Palma and invested with a grand new meaning. It has become a symbol for love and all the ecstasies and terrors that go with it. Jim McConnell, the Gary Sinise character, has been hurt deeply by the death of his wife. He hasn't gotten over it. He no longer goes to Mars. His need in the film is to overcome this, to get over his fears and to go to Mars again. Or to state it literally instead of symbolically, he needs to allow himself to fall in love again. In his article, A Nerd’s Rhapsody, Ray Sawhill discusses some of the symbols at play in the film: “…there's a real vision here … an almost Tantric vision of women (the circle) and men (the column) attaining occasional bliss (the spiral) together … Late in the film, McConnell is being prepared for a long journey. He steps into a lighted circle, is encased in a glass column (those circles! those columns! ), and is submerged in a clear, roiling liquid … Is he dying or in ecstasy? …and [the scene] ends with a blastoff through a column of luminous swirling debris.” If you note the fear on McConnell's face during this final scene until he gives in and allows the fluid to enter him and fill his lungs, it becomes clear that symbolically he is getting over his fear and is falling in love again. He is finally attaining that state of bliss again. He has fully returned to Mars and is ready for the first time since losing his wife to experience the ecstasy and to move beyond. At the center of Mission to Mars is another couple, Woodrow ‘Woody’ (Tim Robbins) and Terri (Connie Nielsen), already in a state of happily married bliss. They are literally at Mars. (Or is it figuratively? The literal and the symbolic are so close to the same in Mission to Mars.) They go through a reprise of the Carrie prom sequence. They dance in ecstatic spirals – to Van Halen’s Dance the Night Away, a one time prom staple. Then, in my favorite and a truly harrowing scene, Terri is terribly hurt by the loss of her loved one. Woody, realizing he is too far away from the party on a space walk to return safely, and seeing that Terri is going to risk her life too in an attempt to save him, removes his helmet and perishes in the vacuum. Like Carrie and Tommy, love’s two greatest fears have been realized for Terri and Woody (notice the echoes in the names). Terri is hurt by her husband and she loses her husband. If one is inclined to only view the surface of Mission to Mars, one will understandably find it disappointing. But it is one of De Palma's richest, most poignant, and most haunting films if looked at more deeply. The opening barbecue sequence makes no sense if taken literally. No space program would expose its astronauts to such a germ factory on the eve of an expedition. But the sequence sets up all the themes of love and loss and fear that the film will be exploring and culminates in the child's sandbox scene. McConnell is looking at the play equipment and footprints in the sand and thinking about his wife and the life and kids he might have had with her. Cut to a footprint that we first perceive to be in the sand before realizing it is on the surface of Mars. What a great cinematic moment! It is a joining or connecting of the literal to the symbolic. The image that fills his remorse with swirls of joyful memories becomes an image of its symbol, Mars. Chew on Mission to Mars all you want, but I suggest you consider swallowing at least a few of those bites from now on. 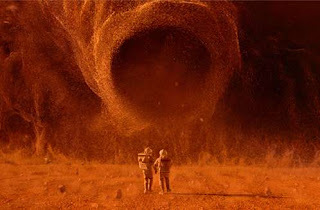 I think Mission to Mars is a candidate for the most underrated film of all time.